The Barn is a passion project of director and writer Justin M. Seaman (10/31, Cryptids) who first conceived the idea for this when he made a series of comics about the topic as a young child. Despite a series of setbacks and issues plaguing the production the vision of a throwback to eighties horrors came to fruition. By so successfully aping the style of movies from that time period a lot of the issues that occurred are reduced and can be dismissed as emulation. While The Barn is not without its problems this singular goal of nostalgia means this holds a charm even when it is at its roughest. Everything about this horror reeks of the 80's and that really is no bad thing, especially when so much love has been put in to ensure things seem authentic. The favourite part of that for me where the TV show segments from Dr. Rock's show (Dr. Rock being played by Ari Lehman who is perhaps best known as Jason Voorhees in the original Friday 13th!). Everything from the style of signs used to the whole way the program plays out just felt so familiar to me. This has everything you would expect a throwback film to have, there is even time for a brief montage when the two heroes are tooling up for the final third, and of course plenty of cheesy rock songs playing out over the action. There is a strange sensation here of it both coming across as tame and inoffensive, yet at the same time having scenes of extreme (but fun to watch) violence and mayhem. Many of the evil trio's kills occur in montage sequences and feature plenty of people being killed in a host of gruesome ways, one victim has their hand sliced off, another has their face peeled off them. Better is the discovered bodies, such as one guy whose head has been hollowed out like a pumpkin. Each of the three antagonists are unique in their own way which gives them a sense of unique identity to them. 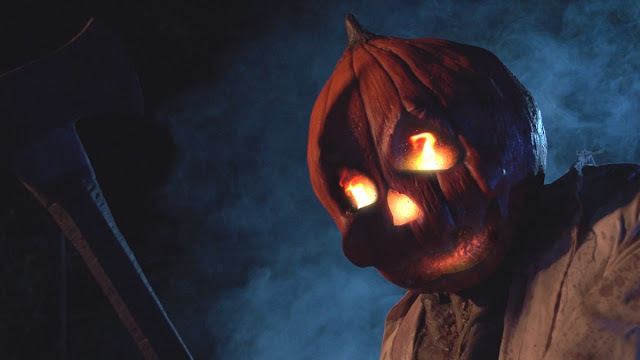 The demonic boogeyman dresses like a miner (played by the director himself), the scarecrow has a great effect on its sack head with the insides full of bugs and sharp teeth, then there is the pumpkin man who has fires burning in his head and is able to spawn from any nearby pumpkin. The design of all three of these was a strong point for The Barn and they all get their time to shine. Apparently the special effects guy got fired deep into the production of this movie and all the effects had to be re-done. I don't know if it is due to this, or due to trying to ape the style of the old horrors but the effects never seemed to go far enough with each person getting a small death scene. More purposeful are the coloured electricity effects that each of the three bad guys has when they are damaged. These looked pretty bad but it is very fitting for where effects were at the time. The main cast were a likable bunch, a lot of the group don't have enough time to get much of a personality to them but I thought Sam and Josh in particular were great leads, I really wanted them to succeed. It was nice to see Linnea Quigley in a small role here (The Return of the Living Dead, Night of the Demons, Silent Night, Bloody Night). There is quite a large cast but most of these are comprised of crowd and so not many really have speaking parts. It felt to me there was a bit of a pacing issue with this movie. For much of the 90 minutes it felt like nothing was really progressing at all, various characters running around getting caught up in chaos without really achieving much. This settles down for the last third but it did create the effect of treading water and a sensation of feeling a bit overlong at times. The plot is silly, but it knows it is, I really enjoyed some of the more B-movie segments such as a late stage heel turn, and I liked the little origin stories provided for the three antagonists. The plot felt a little muddy though with me always a bit unsure just what characters were really trying to achieve. 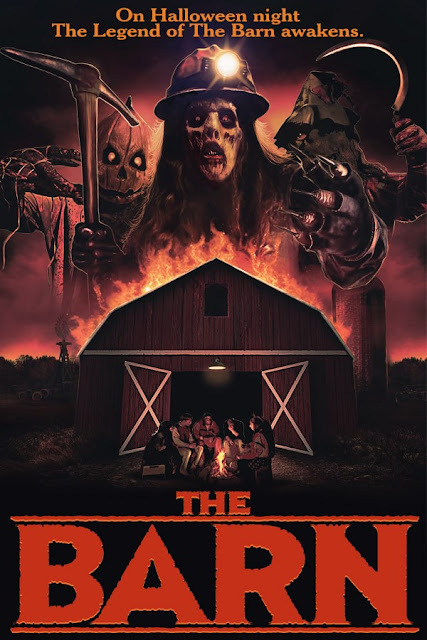 The Barn was a horror that I really wanted to see when I first heard of it a few years back, so I am glad I finally got a chance to see what all the fuss was about. 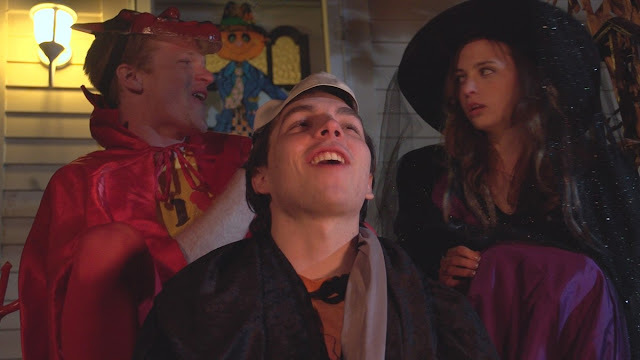 This is a great little Halloween horror that remains enjoyable even when production issues are apparent. There is a love for the material here that is clear to see. It may never carve out its own identity due to following an old formula but by sticking to that formula it ensures there will be an audience who will lap this blast from the past up. Having previously been on DVD The Barn arrived on most digital platforms on July 27th thanks to Terror Films.